Property Size 2,715 sq. ft.
Come stay in our beautiful Bird's Nest vacation home - a 4BR 3.5 BA pool house with a sleeping loft located in the desirable private Sturgeon Beach neighborhood of New Buffalo. The private association beach access is barely a 2 minute walk away, with roughly 50 stairs down to the sand. The main floor of the home has an open floor plan with a living room, a dining area with a table for eight and breakfast bar/island with seating for four additional people, and a fully equipped kitchen. The screen porch is a balcony immediately off the kitchen and overlooks the pool. There is a nice dining table and gas grill located on his balcony. The upper level of the home features a master bedroom furnished with a king bed and an en suite bathroom. It has a balcony overlooking the pool that is shared with the 2nd bedroom, which is also furnished with a king bed. The 3rd bedroom has two twin beds and is located on the opposite end of the house from the master. Just up the stairs is the cupola with two more twin beds. The lower level includes the downstairs family room with it's large wall-mounted flat screen TV and sitting area that open onto the back yard pool area via French doors. The 4th bedroom, with a king sized bed and a full bathroom, is located on the lower level as well. With the screened-in porch for al fresco dining, a private pool to enjoy, and proximity to the private beach, this home is a wonderful vacation spot. The house itself was nice and furnished well. The pool was really nice. The yard around the pool needs attention. Weeds, over grown bushes. 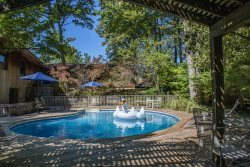 The property is perfect for our family because it is large enough and laid out in such a way that we don't feel on top of each other...we love the Birds Nest!